Clinical history of risk factors: The clinician should determine if there are any comorbid conditions that potentially compromise the child’s immunity, e.g., chemotherapy, steroid use, malnutrition, and congenital immunodeficiency. Symptoms and signs of a shunt malfunction: Shunt function should be evaluated first to define if there is an immediate threat to the patient’s wellbeing. In addition to overt signs and symptoms of increased ICP, a history of decline in school performance or play can also represent mild initial symptoms of sepsis and shunt malfunction. Cutaneous signs of infection: The proximal and distal incisions as well as the shunt tract should be inspected for evidence of wound infection or cellulitis. Persistent pain along the shunt tract, inadequate healing, or early wound dehiscence should also raise suspicion of infection. Ventriculitis: Ventriculitis as a result of shunt infection will be present in approximately 30% of patients. Since the ventricular cavities are isolated in a significant portion of these patients, it is infrequent to find signs and symptoms of meningitis. Focal deficits and seizure activity should raise the suspicion of empyema or abscess formation, although these occurrences are very unusual. Peritonitis: The abdomen should be palpated to determine if there is pain or distension secondary to a pseudocyst formation. Suspicion should be raised for a child who presents initially with abdominal pain and has a ventriculoperitoneal shunt, as one of the manifestations of bacteria-laden CSF can be peritoneal irritation. This presentation can sometimes mistakenly lead to a laparotomy due to the signs of an acute abdomen if the neurosurgeon does not stress that it can be a frequent sign of shunt infection. Patients with spina bifida constitute a group with increased risk for associated intraabdominal complications since motor and sensory levels can lead to masked clinical presentation (73, 83, 107). Septicemia and ventriculovascular shunts: Shunts that are diverted into the bloodstream can cause symptoms that span from malaise and intermittent low-grade fever to local thrombosis to septic shock. Shunt nephritis: One rare form of presentation (4–14% of cases) in patients with chronic vascular shunt infection is shunt nephritis. Chronic staphylococcal bacteremia leads to deposits of IgM and IgG antigen-antibody complexes in the basal membranes of glomeruli. 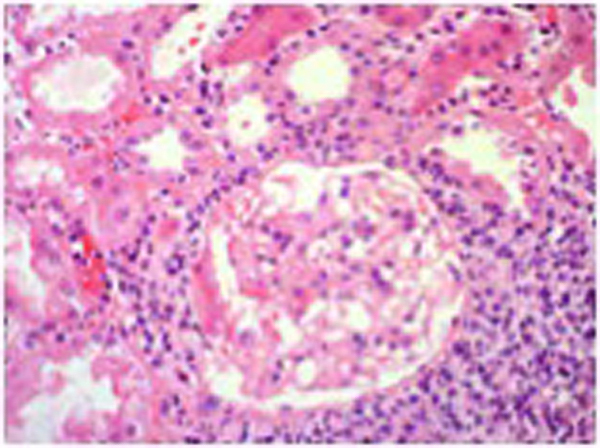 This deposition leads to mesangial cell proliferation and a resulting nephrotic syndrome with proteinuria, hematuria, and hepatosplenomegaly. The removal of infected shunt hardware along with antibiotic treatment usually leads to reversal of these pathological changes (27). Shunt nephritis: Glomerular changes associated with shunt nephritis due to antibody-antigen complex deposition are seen. The usual testing includes cell count, cell identification, glucose content, protein content, protein fractionation, globulin count, VDRL, and cultures for bacteria and fungus. Cell count: The usual total CSF WBC counts are <20 WBC/mm3 in preterm infants and neonates, <15 WBC/mm3 in infants 4–8 weeks of age, and ≤5 WBC/mm3 in older infants, children, and adults. Counts greater than these suggest an inflammatory reaction. Newborns have about 60% polymorphonuclear cells, but in older individuals lymphocytes make up to 75% of the total and monocytes, up to 25%, comprise the rest. The patient’s overall health must be kept in mind, however, as comorbidities such as TORCH and spina bifida can cause elevation in the counts. Glucose concentration: The CSF glucose is typically 66% of blood glucose levels, although it must be remembered that there is a lag between these levels that can last up to several hours. Low glucose levels are associated with increased activity of WBC in CSF as found in bacterial meningitis; however, hypoglycorrhachia can also be observed in Herpes simplex encephalitis, tuberculosis meningitis, fungal meningitis, and meningeal carcinomatosis. Additionally, normal glucose levels can be found in the presence of CSF infection. Protein concentration: The concentration of proteins in the CSF varies with age (young infants can have up to 170 mg) and anatomical compartment (ventricular CSF concentrations, 15-20 mg, are lower than lumbar, 40-45 mg). Increased CSF protein can be due to an inflammatory process in the ventricular system. 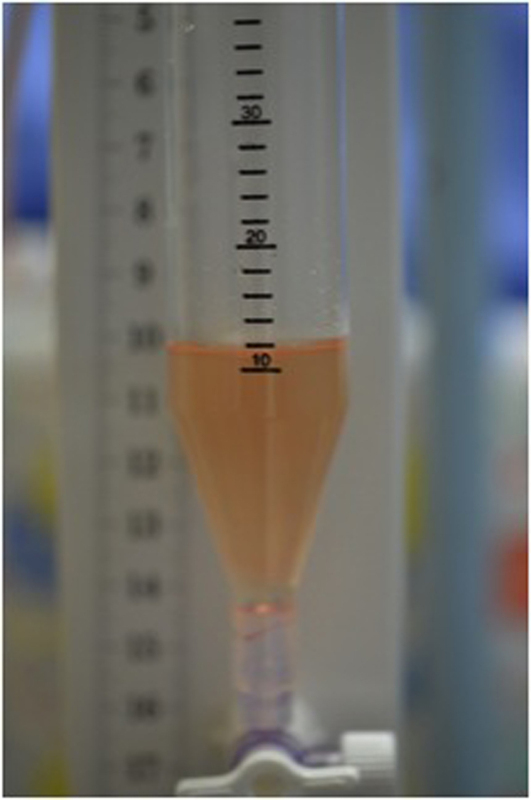 This elevation in the CSF protein will persist for at least 10 days after the second negative CSF culture from the EVD. Microbial cultures: Gram-positive organisms such as Staphylococci can grow in a 36-hour period, while diphtheroids infecting a shunt may take up to 10 days and the growth of Mycobacteriae up to two months. Good communication with the microbiology laboratory is important when trying to identify the specific organisms causing a shunt infection. Blood cultures are positive in 80% of cases of infected vascular shunts, while only 10–15% of other shunts present with a positive blood culture. Shunt series: The shunt series consists of a set of x-rays imaging the entire length of the shunt system viewed from two angles. These typically consist of AP and lateral skull, chest, and abdominal images. 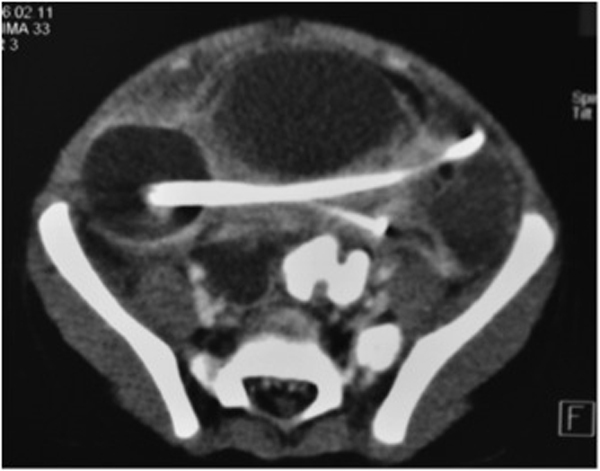 As part of the initial workup, the series provides an idea of the shunt configuration, its continuity, and sometimes even suggests the possible presence of an abdominal pseudocyst or a hollow viscus perforation. Cranial ultrasound: Cranial ultrasound is a widely available test that can provide quick information about ventricular size in a child with an open fontanelle. Abdominal ultrasound: Abdominal ultrasound can reveal the presence of intraabdominal collections such as an infected pseudocyst. 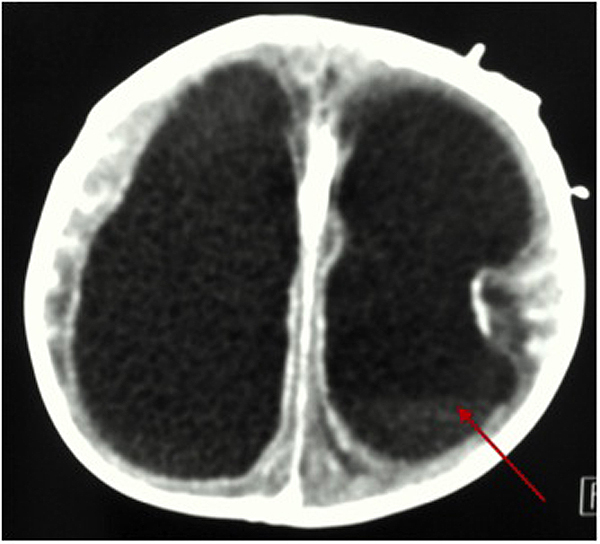 CT scanning: In most centers CT imaging is obtained before a shunt tap or LP is performed, especially in children with impaired consciousness and fever. However, obtaining CT imaging has been questioned if this practice delays the start of antibiotic therapy. CT findings: CT findings associated with a shunt infection can yield evidence of a shunt malfunction with associated ventricular enlargement when compared with baseline studies, inflammatory changes in parenchyma along the shunt tract, subcutaneous pockets of fluid and pus in proximity to the shunt, and brain abscess. Ventricular size and shunt hardware should always be reviewed prior to CSF shunt removal and EVD insertion to determine the number of systems, the shunt tract trajectories, and especially the ventricular size. Abdominal CT: CT findings when an infection is present are usually related to pseudocyst formation with multiple pockets that enhance with contrast. MRI may play a role during the workup of children with shunt infections and associated complications. 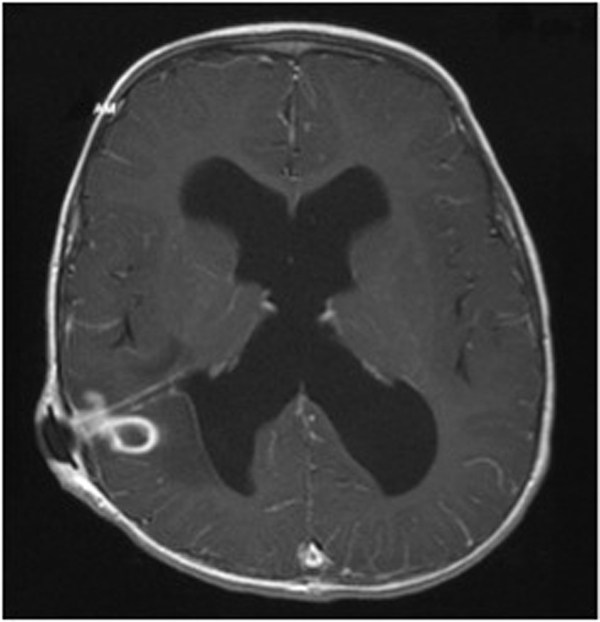 Discovery and definition of associated abscesses and empyemas: MRI can define the extent or septation of an associated empyema or brain abscess. Evaluation for venous thrombosis: The patency of venous sinus structures can be evaluated whenever a thrombosis is suspected. Documentation of ventriculitis: FLAIR imaging can show evidence of periventricular enhancement, and gadolinium administration can reveal pyogenic activity (67). Gadolinium-enhanced axial T1-weighted MRI of an infected shunt: A brain abscess is present along the tract of a proximal catheter in a patient with a shunt infection (87). Assessment of shunt function: Radionuclide testing (shuntograms) has been used to determine the permeability and rate of function of a shunt under scrutiny for sepsis, often adding value to imaging studies to determine the next step in diagnosis or management (115, 148, 157). Documentation of increased metabolism at catheter tip: Recently, a report has described the advantage of using FDG PET/CT scans to determine increased metabolic activity in the tip of infected catheters (161).